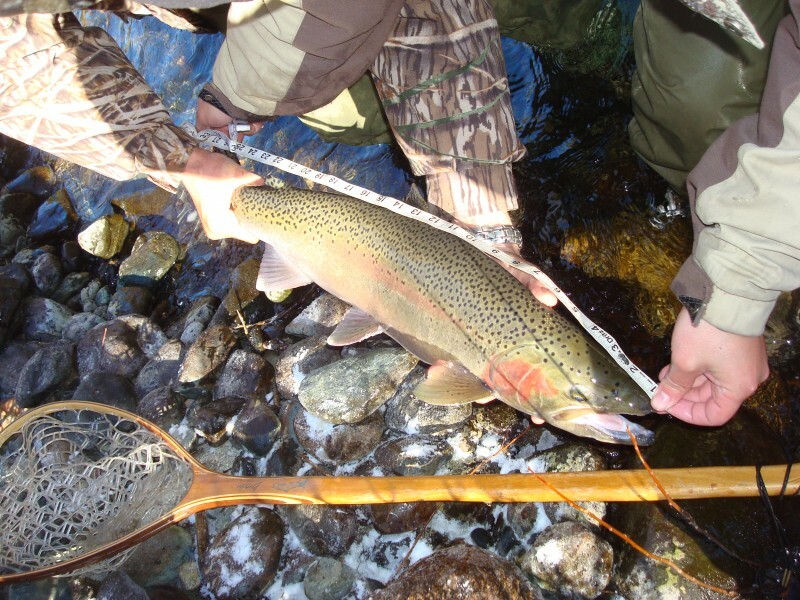 Chile and Argentina Adventures in Fly Fishing! 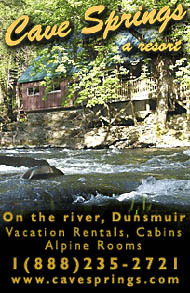 Guides, Lodging, Cabins, Tours and Itineraries for 2011 – 2012 Season. Just give us an indicator and we’ll set you up for the catch! 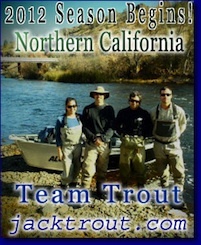 Jack & Carola Trout and the Guides of Chile & Argentina. 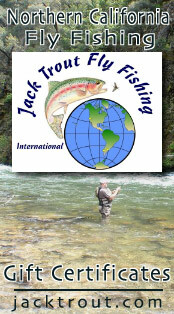 Stay tune as Jack & Carola Trout head to Brazil & Ecuador to check out new waters and jungles. What a site to see from the top of the mountains here in Bariloche, Argentina. On a recent trip we toured through Junin, San Martin, Bariloche and witnessed some of South America’s greatest views and fly fishing. This part of South America is amazing with its endless peaks and landscapes that leave one breathless in awe. Amazing to think just off in the distance as far as you can see in this picture is the Andes Mountains of Chile. I love this place and plan on bringing lots of you here to be guided by the Argentine guides I know while guiding you myself with Carola in Chile. 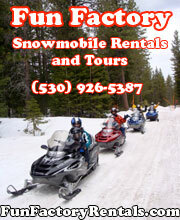 We look forward to an awesome end as we start to plan our 2011 – 2012 season for next year. Some of you have already contacted us with that in mind and we say, we can’t wait to make your travels in South America a great one! Thanks for making this one of the best seasons ever. Richard and Diane from Arizona had such a fun time with us earlier in the season that they told two of their friends and soon after we received a call from Clyde and Davida Robinson from Tucson Arizona. 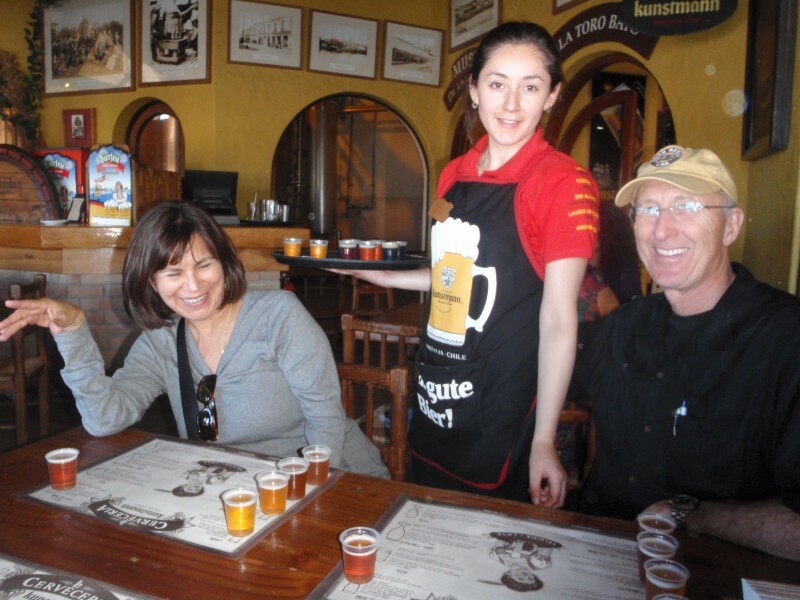 They arrived and we took them on a beer tour in Valdivia, Chile. They loved it! Soon after that we found ourselves on a small mountain spring creek and I was teaching Davida how to fly fish for the first time. The creek was small but full of rainbows and browns and it didn’t take long for her to hook up and enjoy her first experience in fly fishing. Plus she hooked up on dry flies, so for her first experience what could be better! Then we went to the Rio Dios and she hooked up there too! Davida was on a roll folks and she loved every minute of it. Soon after that Clyde started hooking trout too and both were having fun and off to the races!! 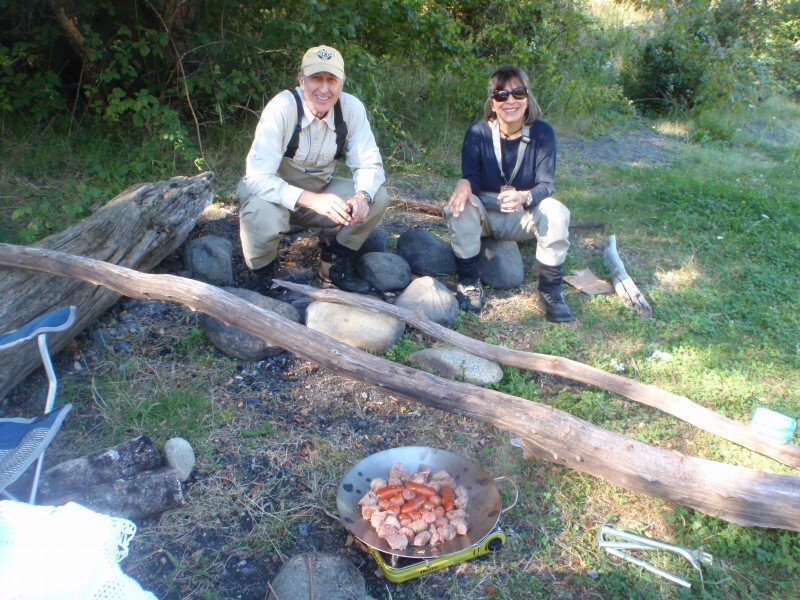 Then we prepared a wonderful lunch and talked about anything and everything and a whole lot of nothing, folks we were having us a big time hoot out there in the forests of Patagonia Chile. Then Clyde hooked another and we all cheered him on! It was a nice trout that fought hard and pulled its weight around and Clyde’s reel too. 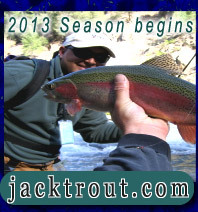 I knew then this was the making of another great Jack Trout adventure. 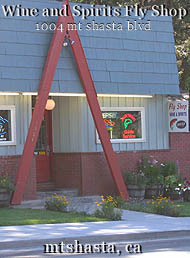 Then one day on the Klamath River maybe 15 years ago, I met a guy named John Angerer and we talked for a while about fly fishing, little did I know he would contact me with his wife for a fly fishing trip in Chile and Argentina…. 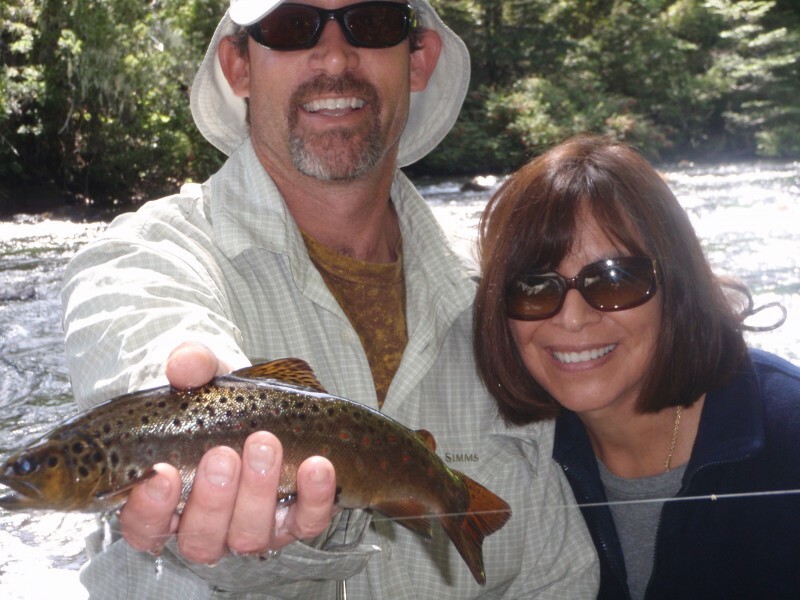 John was as happy as could be when he started hooking trout on the Rio Dios. 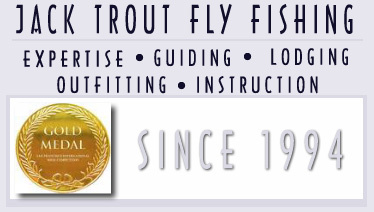 What a great trout indeed, as we stayed out late to see what others could be landed.. It was a great trip and his wife Charlotte loved it too. The views were spectacular as only Chile could offer and the scents of fresh air, cool mountain breezes and good vibes filled the air around us. If I know my luck, we’ll hook some more big trout down the line..
What a fine photo of a great couple out in the forests of Chile. 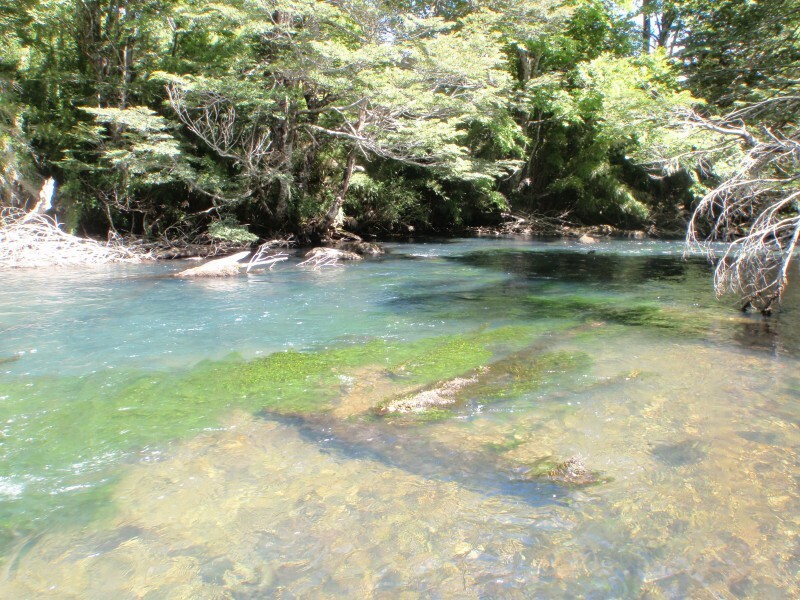 On the Rio Petrohue we hooked up on some more trout the instant we arrived. What a beautiful place to be on Earth and the waters -WOW! 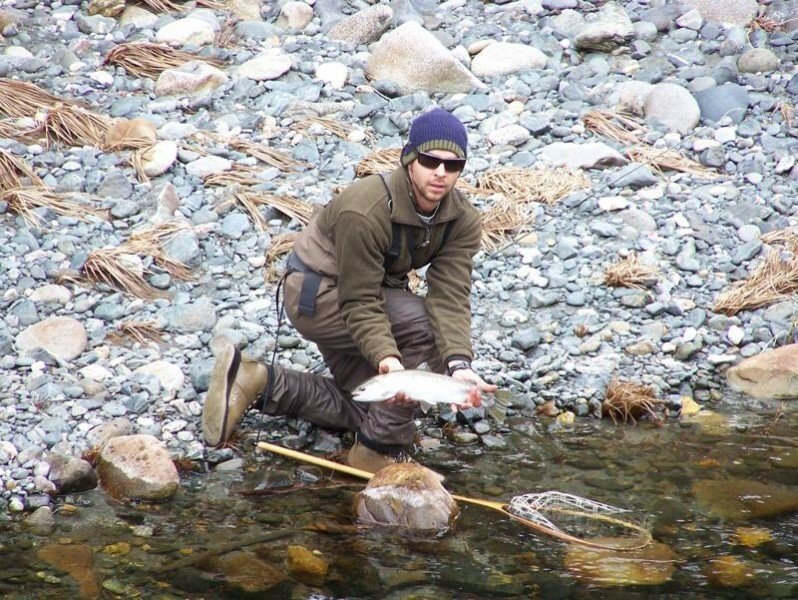 Then we hooked up on another great trout I could see clearly from the high rock I was photographing from. Later the next day, we took them on a tour to the Isle de Chiloe to see the penguins, mystic beaches and endless panoramic views. 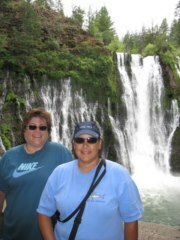 It was a dream trip for a couple who loved sharing time together in far off places in the world. 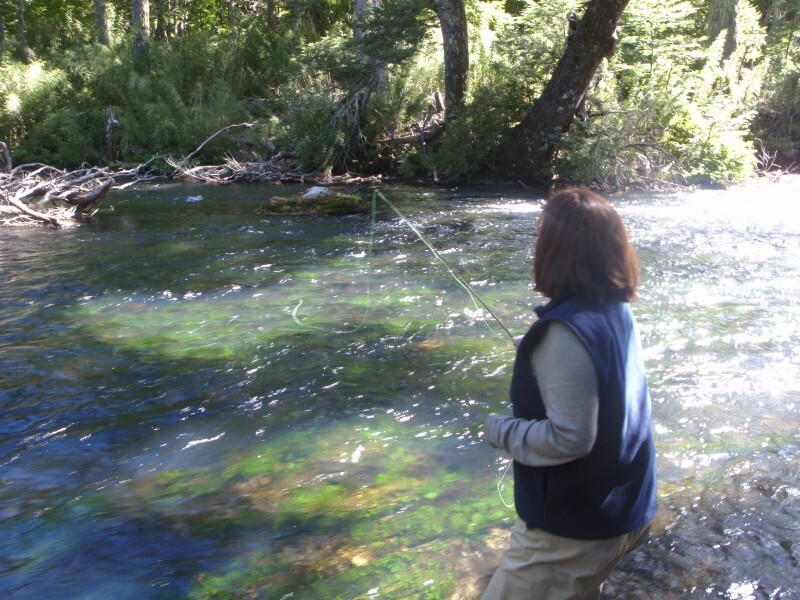 Then back out fishing on another river but this time in the Lakes District of Chile. 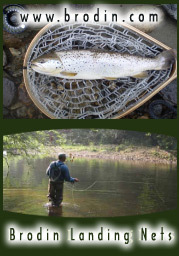 We hooked 2 nice browns that day and some other smaller trout, all in all it was a great day and John enjoyed himself. Also this lovely brown beast that had spots as big as its eyes which is rare my friends. JOHN ANGERER OF SACRAMENTO, YOU’RE MY SIZZLER OF THE WEEK AWARD WINNER!! A huge kype, hook-jaw and shoulders like a linebacker from the Green Bay Packers. Kind of a brainy character as my dad would say..
Then I prepared lunch and we ate like kings and talked about how the girls were on a tour to see the lovely towns of Frutillar and Puerto Varas Chile. The next day we headed from our place in Los Lagos, through Pucon and over the Andes Mountains to Argentina. Near dusk we arrived near San Junin de los Andes and saw all these Red Deer on the hillside and one amazing stag that dropped all of our jaws to the floor! 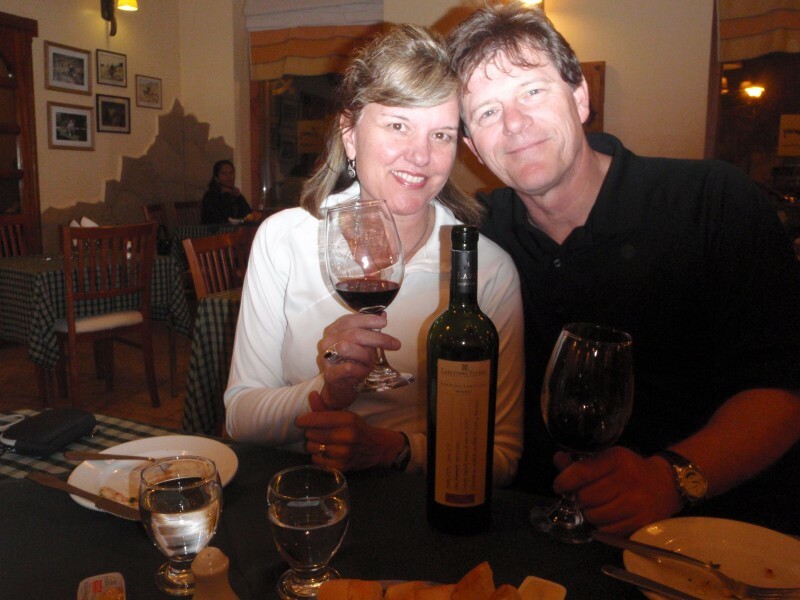 Soon after that we were all enjoying great food and wines in the Ruca Hueny Restaurant in San Junin, one of the best places in all of Argentina to enjoy real Argentine cuisine and parrillas. 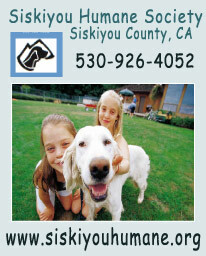 http://www.ruca-hueney.com.ar Click on this link to see their site! Folks we ate delicious spring lamb, steaks, sausages and their own chimichurri salsa that is simply amazing. They even made me up a special bottle to bring back over the hill to our home. 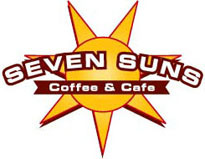 I love this place! The next day was Sunday and at 8 am we headed over to the tourism bureau in Junin to pick up John’s license for fishing. 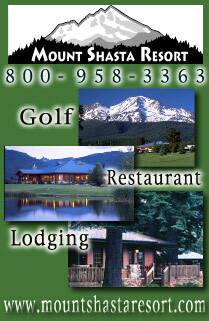 Can you believe a tourism bureau open on a Sunday at 8 am to pick up a license? Wish Chile had their act together like this, there would be a whole less poaching and licensed fishermen out there. I was really impressed as always, how organized Argentina is on angeling regulations, protecting their rivers and streams from harvest. 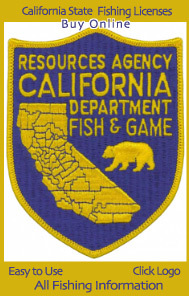 Especially how easy it is to obtain a fishing license and be legal. COOL STATUE DON’T YOU THINK SIZZLERS!! Catch & Release metaphor, you got my attention bro! Cool dude at the office selling licenses up bright and early, I brought him some great brews from Chile to enjoy after work. I like a tourism bureau thats sells fine Argentine wines on the side, what a great place, also great fly fishing stickers to put on my boat.. That Rocked! Not before long we were out on the Rio Collon Cura with my guide Juan Trucha and John hooked up within minutes on an Argentine fatty! John showed off his prize and we were off to the races as we only saw a few other boats the entire day.. 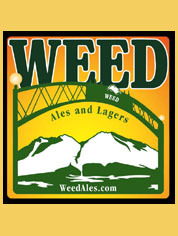 This was a favorite river of the famous legend Mel Kreiger, who when passed a few years back all the bars, fly shops and guides took a day off and closed in his honor. He is still loved by all in Argentina for getting these rivers through the Argentine Government catch and release only rivers. This is what makes Argentina so prominent as a fly fishing destination, the rivers and the guides are dead on correct about protecting what they love and know is right. In the airport in Bariloche Argentina are life size photos of Mel Krieger, they even sell a honey in Argentina named Miel Krieger. It’s pretty funny how fanatic they are here about Mel and Fanny Kreiger. Guenaco off in the distance, can you see him? I couldn’t remember the last time someone else rowed the boat and I got to fish all day. It was a fine day indeed..
Juan prepared a great lunch and we munched out and laughed our …es off! What a fun guide to be out on the river with. He really knows the river and we were hooking trout most of the day with no one else around. After Lunch Guia Trucha put John into a nice riffle to wade and he hooked this lovely trout, as I nymphed one up myself upstream! When staying with us in Argentina this where we put our valued clients on their adventures in Patagonia Argentina, right down the street from the best restaurants in San Martin de los Andes at a great price of course. Cozy bed for making love is always nice, the wife will love that! 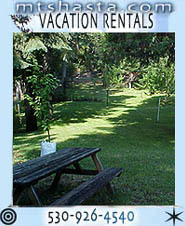 Heck just rent the whole place for your family, Carola and I can arrange all of that no problem! Lets take the gondola to the top of the mountains in Bariloche Carola! OMG what a view Sizzlers!! It was magnificent to see the entire valley and city of Bariloche and Lago Nahuel Huapi, this is a must see if you visit the region. 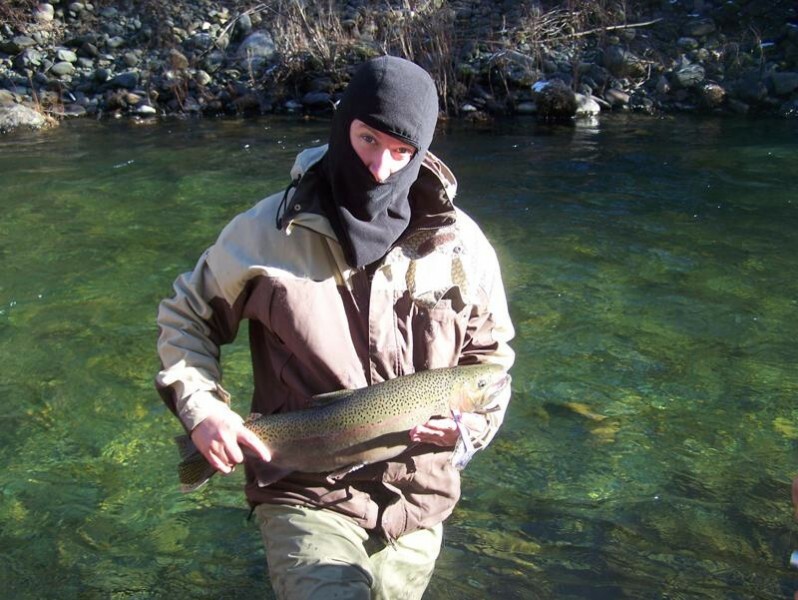 Many of you may know of my guide up in Mount Shasta, California named Isaac Roman, he’s one of the hottest steelhead guides in Northern California. 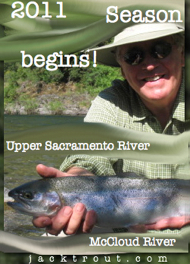 He guides on the Klamath, Lower Sacramento, Upper Sacramento, Scott and other places we don’t even talk about.. 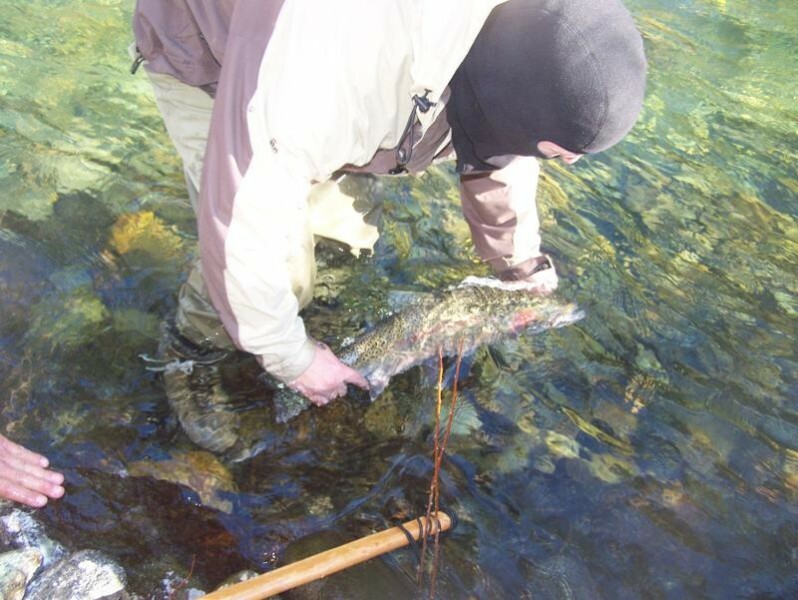 When folks are out with him they catch steelhead like this.. 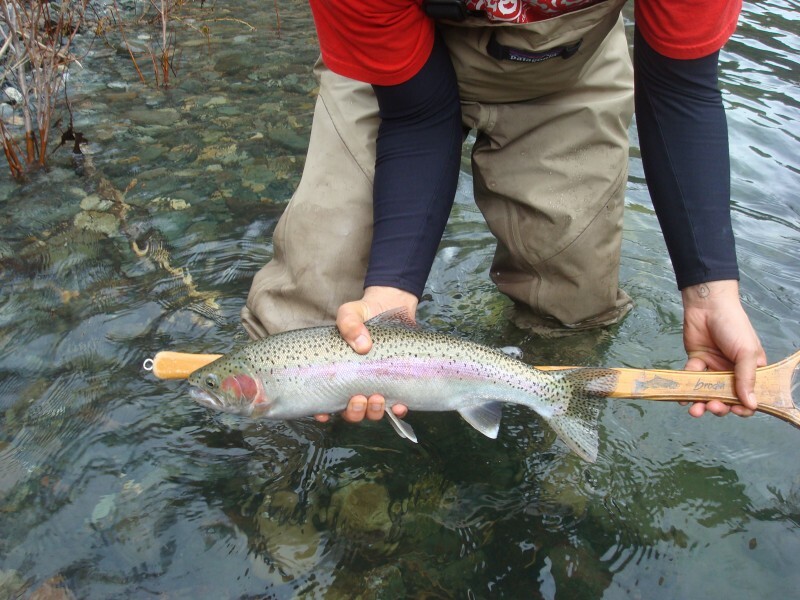 He uses the best nets like Brodin to protect his catches and because of this he gets his people into the biggest steelhead in any stream or river in Northern California. That’s why it could be your last chance to hook up on one of these fine beauties, so give me a ring or and email and I can arrange for you to be guided and hook into a steelhead of a lifetime with one of the best guides I know… Issac Roman – Rome is flowing folks into your life, let him guide you now!